Kiruna is currently undergoing a radical transformation, which involves a gigantic move for the whole town. This is so that the mining company LKAB can extract more of the iron seam that cuts diagonally downwards beneath the town. 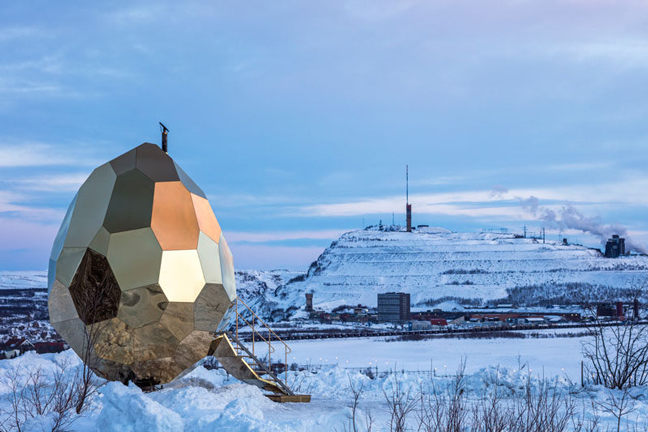 The iron ore is and has been – ever since it first began to be extracted at the end of the 19th century – an important source of income for Sweden, and absolutely vital for the town of Kiruna. No mine, no town. But the breaking up and devastating transformation of the landscape, the environment and the architecture caused by the move are also sparking a lot of debate. 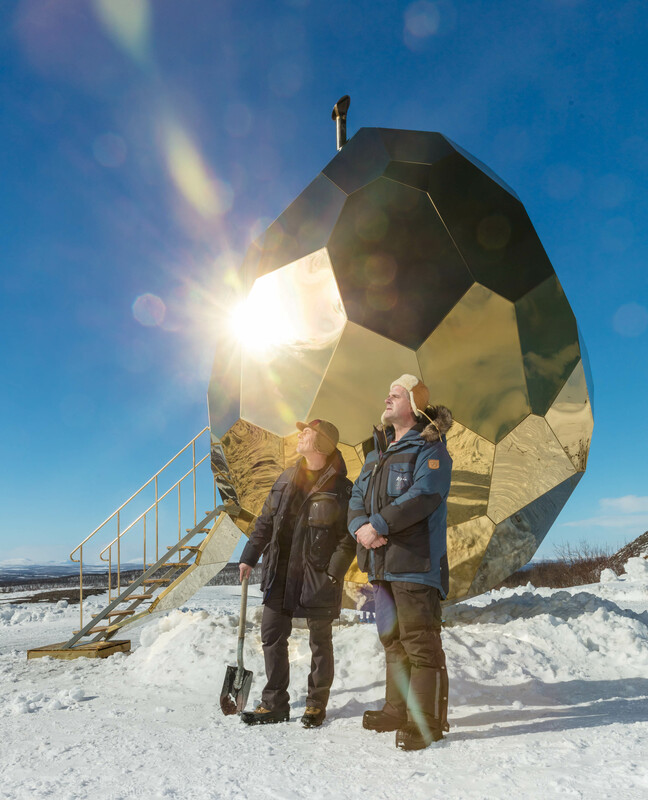 Solar Egg has been made as a social sculpture where local people and visitors to the town can meet and, for instance, discuss these challenges. 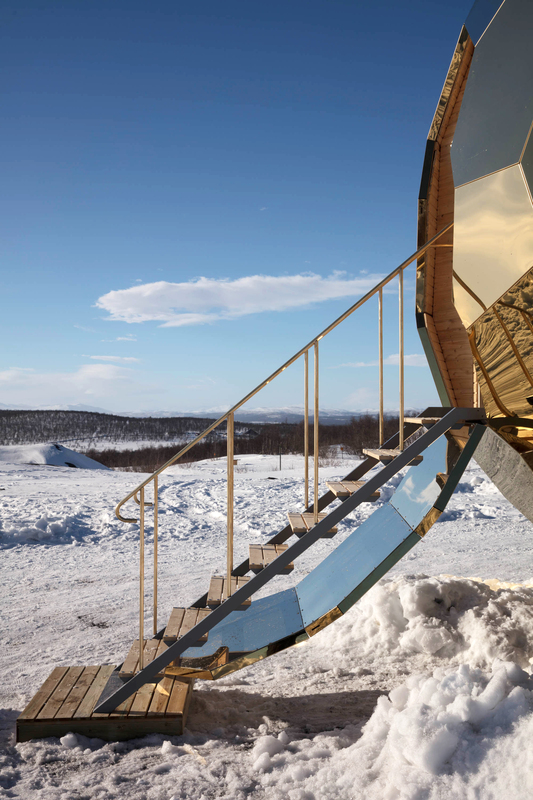 In the arctic climate of Lapland the sauna occupies a key position, as a room for warmth and reflection. B&B have taken up this tradition and developed a sculptural symbol that prompts thoughts of rebirth and an incubator that nurtures conversation and exchanges of ideas. The project is a continuation of the artists strategy to incorporate the climate into the experience of the artwork which was initiated with the Climate Chambers in 1994. 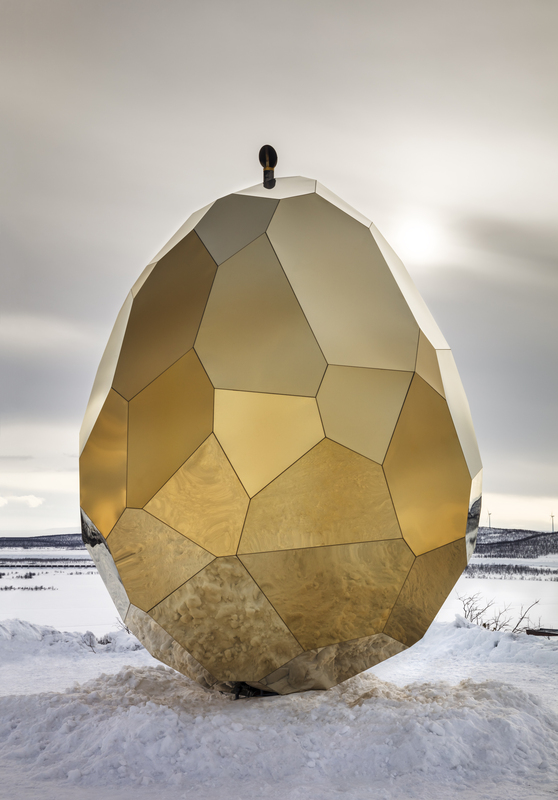 The egg is made out of stainless golden mirror sheeting, its multifaceted form breaking up the surroundings that it reflects into a multiplicity of different mirror images. Landscape, mine, town, sky, sun and snow are here combined into a fragmented image that can evoke associations with the complexity spanned by today’s discussion about climate and sustainable community development. The egg’s interior has been formed out of wood, with the wall panels and floor decking made out of pine and the bench of aspen. 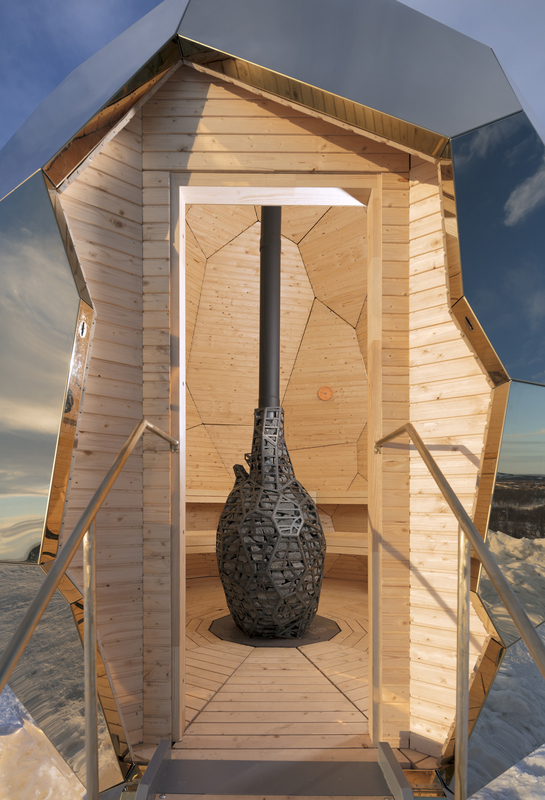 In the centre of the egg stand the wood-heated, heart-shaped sauna stove made out of iron and stone. 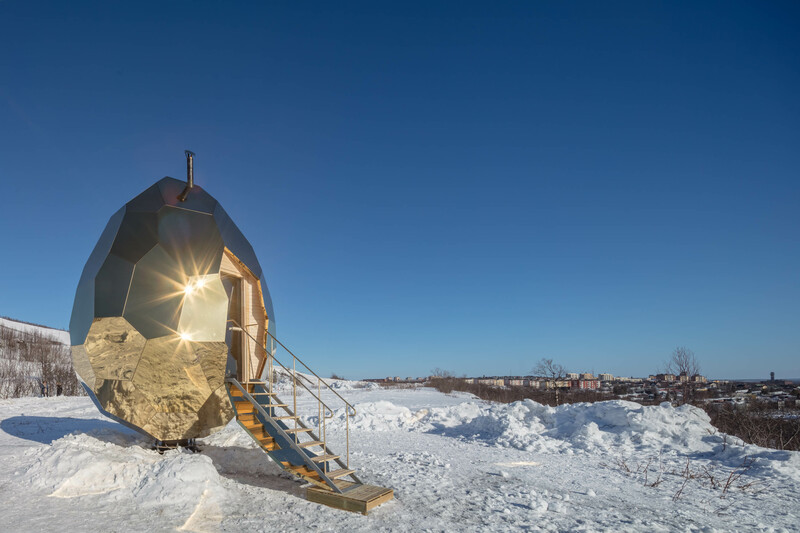 Encapsulating Swedish creativity, inspiration and design, Solar Egg will be exhibited at the Swedish Institute in Paris towards the end of the year, as part of the Swedish Design Moves initiative.